no 3'-OH group to form a phosphodiester bond with an incoming nucleotide. Thus, ddNTPs terminate DNA synthesis. 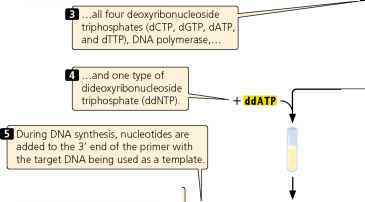 Either the primer or one of the dNTPs is radioactively or chemically labeled so that newly produced DNA can be detected. ^ When a dideoxynucleotide is incorporated into the growing chain, synthesis terminates because the dideoxynucleotide lacks a 3' OH.